Evaluación histológica de Straumann Bone Ceramic® en defectos óseos en tibias de conejo. la proliferación celular para esas áreas. Profesora del Departamento de Patología (UFSM - RS, Brasil). Investigador de ICB (USP - RS, Brasil). Maestro de los cursos de Implantología del Instituto Bioface. Profesor de UNICASTELO (RS, Brasil). Furusawa T, Mizunuma K, Yamashita S, Takahashi T. (1998). Investigation of early bone formation using resorbable bioactive glass in the rat mandible. Int J Oral Maxillofac Implants;13(5):672-676.
characteristics of four bone substitutes. Int J Oral Maxillofac Implants;11(1):55-66.
bone implants. J Oral Maxillofac Surg;48(10):1068-1074.
an alternative implant materials for ear surgery. Acta Otolaryngol;106:331-338. Frank RM, Klewansky P, Hemmerle J, Tenenbaum H. (1991). Ultrastructural demonstration of the importance of crystal size of bioceramic powders implanted into human periodontal lesions. J Clin Periodontol;18(9):669-680. Junqueira LC, Carneiro J. (1995). Histologia Básica. 8 ed. Rio de Janeiro: Guanabara Koogan. stage sinus floor elevation and implantation procedure. A human case report. Clin Oral Implants Res;.9(1):59-64. Dos Santos LA, De Oliveria LC, Rigo EC, Carrodeguas RG, Boschi AO, De Arruda AC. (1999). Influence of polymeric additives on the mechanical properties of alpha-tricalcium phosphate cement. Bone. ;25(2 Suppl):99S-102S. John HD, Wenz B. (2004). Histomorphometric analysis of natural bone mineral for maxillary sinus augmentation. Int J Oral Maxillofac Implants.;19(2):199-207. Griffon D. (2002). Evaluation of osteoproductive biomaterials: allograft, bone inducing agent, bioactive grass, and ceramics. Helsinki, Finland, 105p. Dissertation (Division of Surgery) - Department of Clinical Veterinary Sciences, Faculty of Veterinary Medicine, University of Helsinki. GEHRKE, Sérgio Alexandre et al. Evaluación histológica de Straumann Bone Ceramic® en defectos óseos en tibias de conejo.. Actas Odontológicas (Publicación discontinuada), [S.l. ], v. 6, n. 1, p. 69-78, apr. 2016. ISSN 2393-6304. 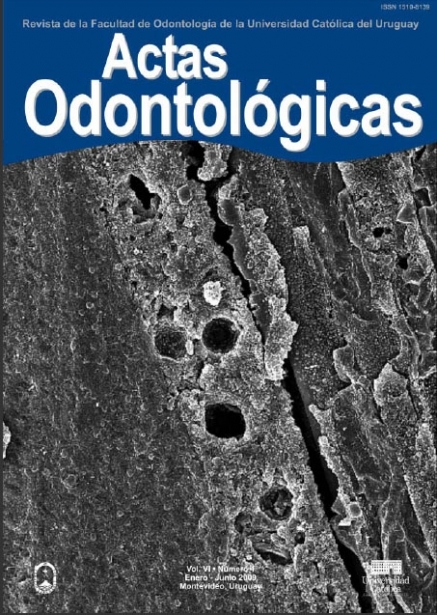 Disponible en: <http://revistas.ucu.edu.uy/index.php/actasodontologicas/article/view/1089>. Fecha de acceso: 20 apr. 2019 doi: https://doi.org/10.22235/ao.v6i1.1089.